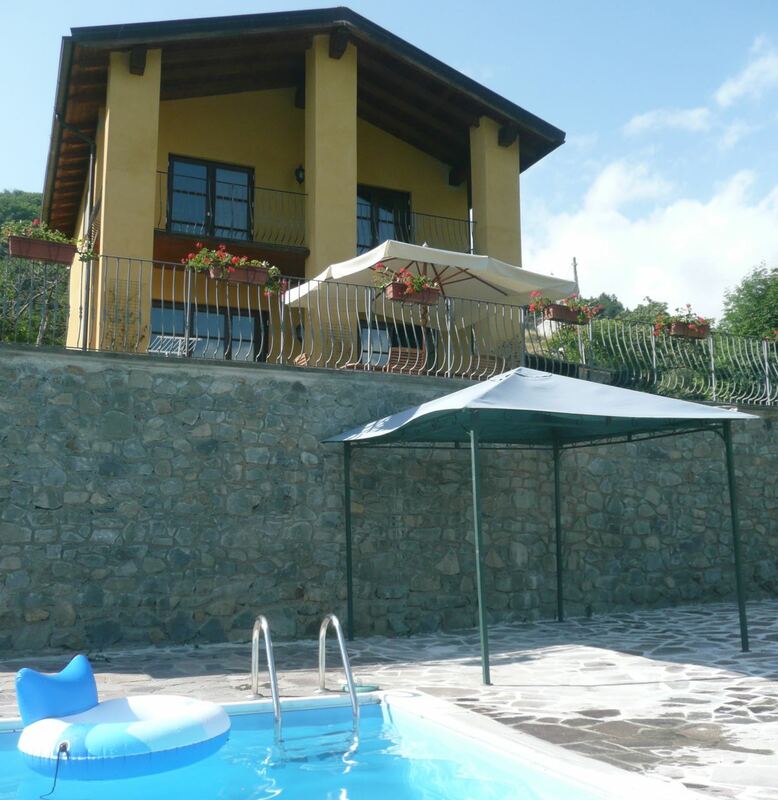 Only 10 -15 minutes from the town of Bagni di Lucca and positioned within its delightful hills, lies Orchard Heights in the village of Riolo. A modern house, completed in 2007, which is surrounded by an abundance of fruit trees and cocooned by a chestnut and pine forest. It is completely secluded, sitting in its own grounds of 3.5 acres. The house consists of: 3 bedrooms, 2 bathrooms, kitchen, dining area and living room. There is a private swimming pool and a large terrace that borders the property. The restaurant Il Biribisso, in nearby Granaiola, is approximately 5 minutes by car. Bedroom 1: King size bed, bedside tables, 2 double wardrobes, shelves, balcony with beautiful views. Bedroom 2: Double bed, bedside table, double wardrobe, balcony with beautiful views. Bedroom 3: Twin beds, bedside table, lovely views. Bathroom 1: Full size bath with shower over, toilet and basin. Bathroom 2: Separate shower, toilet and basin. Large electric oven with a 5 burner gas hob over and extractor fan, electric kettle, dishwasher and fridge freezer. Well equipped cupboards with mixer, juicer, coffee pot, crockery, cutlery, saucepans, bowls and oven ware. Solid oak dining suite for 6 people. Living Room: 2 leather settees to seat 6 people, 37" plasma TV with surround sound home theatre system, DVD player and extensive DVD library. CD player and games. Washing machine, tumble dryer and ironing facilities. Towels and linen are included in the rental rates. Should your stay be for longer than 7 nights, then the linen and towels will be changed and the house cleaned. Barbecue, private pool, dishwasher, fridge freezer, oven and hob, iron, microwave washing machine, central heating, cot, high chair and TV. Some elderly residents do live in the area and Orchard Heights is suitable for elderly guests provided that they are mobile and able to walk with ease. regrettably, the house is not suitable for wheelchair users or anyone who has difficulty with walking. Access to the house is via an unmade track which is initially steep but perfectly alright for confident drivers. There is plenty of parking close to the house. The swimming pool is a below ground pool and is completely secluded, it measures 9m x 4m x 1.4m (constant depth) the perfect size for a swim. Pool furniture is provided (sun loungers, table and chairs, umbrella and pool toys). The house is surrounded by countryside and deer regularly visit the grounds, which is a sheer delight whilst having your morning coffee on the balcony. Wild boar also make an appearance but only late at night and when the surroundings are still and quiet. Eagles can be seen soaring high up in the sky, catching the thermals and during the month of June, fireflies can be seen twinkling in the dark like little stars gently flashing. It truly is a wondrous and enchanting location to experience nature in your very own wildlife park. The pool is open from April until the end of October. We prefer that all arrivals be on a Friday or a Monday, however, should you have a specific day in mind, please feel free to contact us. The house must be vacated by 10 a.m. for departures and arrivals are to be from 4 p.m. this gives our housekeeper enough time to ensure that the house is ready for the next guests. Thank you. A deposit of £250.00 will be required on booking and the remainder is to be received 8 weeks prior to the date of your arrival. An additional security deposit of £250.00 will be required with your balance and this will be refunded within 14 days of your return home, provided that there are no breakages or any damage to the property or its contents. Please contact us for our terms regarding cancellations.